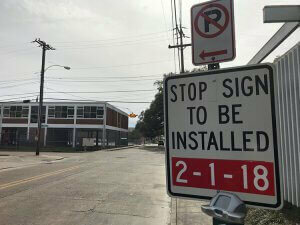 A new stop sign is set be installed on Lafayette Street at the Convent Street intersection on February 1, 2018. If you frequently drive in the Downtown Lafayette area, you are probably familiar with the intersection at Convent Street and Lafayette Street. You’ve likely witnessed the significant confusion that occurs between drivers approaching the intersection at the same time. The intersection has flashing signal light. Lafayette Street drivers have a flashing yellow light, which indicates you should proceed with caution through the intersection. Convent Street has a flashing red light, which indicates you should stop at the intersection. The Convent Street drivers also have a stop sign. Far too often, Convent Street drivers unfamiliar with the intersection assume it is a 4-way stop. Which it is not. They come to a stop at the intersection and proceed to drive through, under the mistaken assumption that the cross traffic will also be stopping. This results in lots of near-miss incidents and quite a few side impact collisions. As someone who drives down Lafayette Street regularly, I have personally observed 3 collisions at this intersection. On more than one occasion I’ve had to adjust my driving to avoid a car moving through the intersection out of turn. It is clearly a hazard. Very recently, warning signs have gone up on Lafayette Street alerting drivers of the upcoming traffic change. 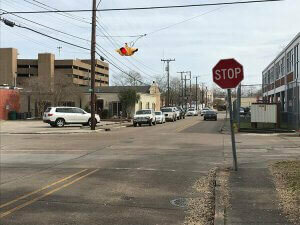 Lafayette Street drivers can expect to see a new stop sign installed on February 1st. The intersection will become a 4-way stop. Changes in traffic flow require some getting used to. Drivers unaccustomed to stopping at the intersection may not initially notice the new sign. If you regularly travel in the Downtown Lafayette area, be on the lookout for the new stop sign. When you approach the intersection be extra careful. Assume the other drivers may not notice the new sign. Downtown Lafayette has a lot of foot traffic. Drivers need to be mindful of pedestrians expecting them to stop at the intersection. Constant vigilance is critical to safe driving practices. Avoid distractions behind the wheel. Don’t text and drive. Obey the speed limit. Be aware of the constantly changing environment on the road. If you are injured in a car accident, you may need an attorney’s assistance. Our firm has over 20 years experience with car accident cases. Contact the Law Offices of L. Clayton Burgess to schedule a free consultation. We are here to help. Don’t Delay, Call Clay!